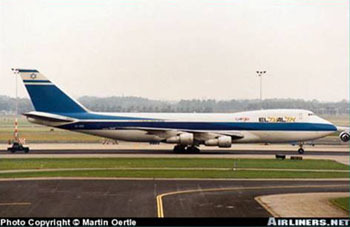 A Boeing Model 747-200 freighter, powered by four Pratt & Whitney JT9D-7J engines and operated by El Al Israel Airlines, experienced the separation of both engines from the right wing (engines 3 and 4) during climb out from Schiphol Airport, Amsterdam, Netherlands. The separation of both engines resulted in loss of control of the aircraft and subsequent crash, killing all four people on board as well as 43 others on the ground. It was later determined that the inboard engine and strut (engine 3) had separated from the wing and impacted the outboard engine (engine 4), causing it to also depart the aircraft. This accident was one of several engine separation events leading to an industry-wide change in strut design philosophy.